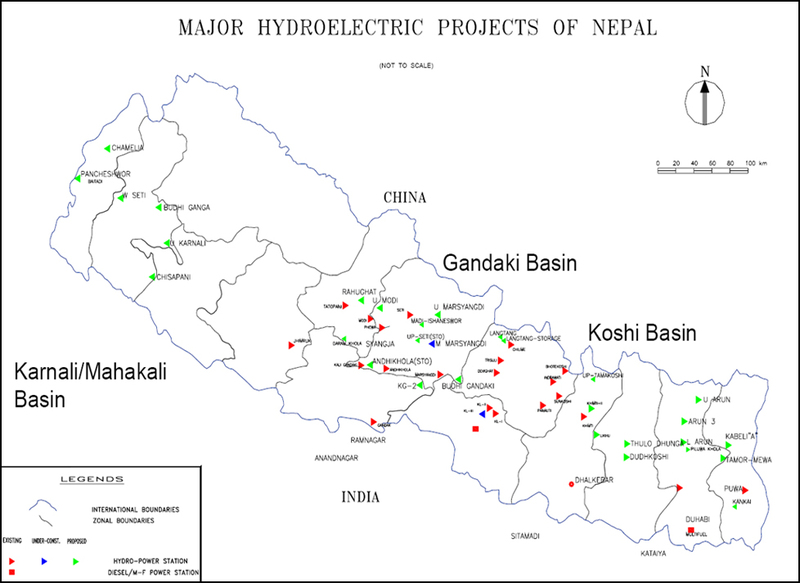 Nepal is naturally endowed with huge potential for hydropower. Its steep terrain and the snow-capped mountains in the north provide ample opportunity for the production of hydroelectricity. Nepal is said to have a techno-economically feasible hydropower capacity of 43,000 MW of which only 617.48 MW has been harnessed (2008). In addition to the hydro generation 55 MW has been generated from thermal resources. One can therefore conclude that there are a lot of untapped resources available in the country for augmenting hydropower generation. Nepal’s energy demand is growing at the rate 12 % per annum. This demand rate will increase if cheaper electricity can be provided to more of the country. It will further increase if the industrial sector can be assured of uninterrupted power supply at reasonable prices. Add to that the rapid growth in population of the country and we could have a very high growth of demand for electricity in this country. Nepal is strategically located between two power hungry nations. In addition to its own growth, Nepal’s neighbors too have extremely high level of energy requirements. India is said to be deficient of 25,000 MW of power to continue its growth. Likewise China is also seeing huge industrial growth and will require substantial amounts of power to sustain this growth. So both China and India are potential buyers of power Nepal can produce. Nepal is relying excessively on fuel wood as its primary energy resource. It is clear that this is not sustainable because no sustained effort has been made to continue the usage of this resource. It is therefore imperative to convert our fuel consumption pattern from non-renewable to renewable sources. Hydro-electricity is the most attractive and obvious form of renewable energy that can be harnessed in Nepal.